Lynn Fedele sits at a booth at a natural-food deli, next to a wall painted light jungle green with bright red accents. She sips a steaming cup of peppermint chamomile tea and talks politics. "I think it's very important to take the House out of the hands of the Republicans," she sighs, referring to the battle for control of the U.S. House of Representatives. She instead voted for Jill Stein, hoping that her Green Party would get 5 percent of the vote and the federal matching funds that go with it. Stein finished with just over 1 percent of the U.S. vote. FILE - Rookie Democratic candidate Lauren Underwood greets supporters at the opening of her campaign office in St. Charles, Ill., July 29, 2018. If elected to the U.S. House in the midterms, Underwood would be the first woman and first minority to represent the predominantly white district once represented by GOP House Speaker Dennis Hastert. The U.S. midterm congressional elections, held halfway through a president's term, typically signal the public's judgment of the performance of the incumbent president. If voters turn against Trump, they could change the control of Congress. Democrats need a net gain of 23 seats in the House to take control of that chamber and two seats in the Senate to achieve a majority there. Many analysts agree the key voting bloc that could flip Congress consists of women like Fedele. Educated? Check. She has a master's degree in English and has been teaching high school English for 27 years. 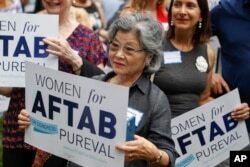 FILE - Supporters gather to listen to former U.S. Rep. Gabby Giffords and Hamilton County Clerk of Courts Aftab Pureval speak during the "Women for Aftab" advocacy group kickoff event in support of Pureval's 1st House District challenge to veteran Republican Rep. Steve Chabot, June 13, 2018, in Cincinnati. A Politico poll taken in mid-September showed more than 64 percent of women were "very motivated" to vote in the midterms. Among Democratic women, that number jumped to 71 percent. Fedele believes the bitter battle to confirm Judge Brett Kavanaugh to the U.S. Supreme Court and the sexual assault accusations that were brought against him by Christine Blasey Ford and Deborah Ramirez will prompt many more women to vote for Democratic congressional candidates. Fedele said the way Ford was treated and mocked by Trump and Republican senators "is an affront to any woman who has been assaulted." On the other hand, Trump, Senate Majority Leader Mitch McConnell and other GOP leaders insist the Kavanaugh debate — and what they characterized as an "angry mob" of Democratic protesters — will motivate Republicans to vote for Senate candidates to confirm more conservatives like Kavanaugh. "It's so contentious. I just don't enjoy politics anymore," she said. Democrats have typically won the women's vote since 1992, according to Pew Research. In the 2016 presidential election, Clinton won the overall women's vote with 54 percent. But she lost the white women's vote — 52 percent of them voted for Trump. However, college-educated white women were more inclined to vote for Clinton than Trump, and they are overwhelmingly supporting Democratic candidates in their congressional districts this year, according to a new Washington Post-Schar School survey. Chris Elliott backed Trump. She emigrated from Ireland as a child and now lives in New Jersey. Her political hot buttons are jobs and education. She's voted for the past 40 years but said she's never seen partisan acrimony like this. Elliott blames the president and said he's turning female voters away because they don't like how he "acts like a bully." Though she regrets voting for Trump, she will remain a Republican voter in the midterms because of the administration's strict immigration rules that have cracked down on illegal immigrants. "That illegal alien," Elliott said, "I'm not for that." Brigid Callahan Harrison, a professor of political science and law at Montclair State University in Montclair, N.J., and author of Women in American Politics, said she's seeing presidential "buyer's remorse" like Elliott's among white Republican women, specifically young white women. That remorse, she thinks, will determine the outcomes of many competitive House races. "Perhaps some of these women will now flip to the Democratic side, or young women will be increasingly mobilized to vote," she said. 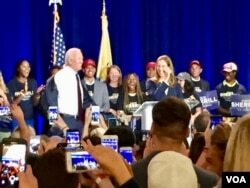 Political analysts are looking at New Jersey's 11th Congressional District, which includes Montclair, as an illustration of that pushback by women voters. "A lot of our women voters are concerned about the same economic issues that all of our voters are," Sherrill told VOA. "We have infrastructure needs. We have health care needs here, like the rest of the country. So a lot of women, some of them heads of the household [or] ... single mothers, they're very concerned about the economy as well." 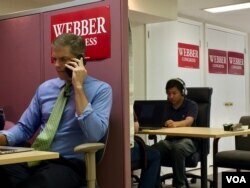 Webber said female voters want the same thing as men, and that's what he's campaigning on: "A thriving economy. The opportunity to have a job and provide for their families. And save for retirement and their kids' education."